After the Roc d’Azur bike show I was kind of depressed because of the price of the Enduro mountain bikes. So, I decided that my old Turner RFX will last a couple more years. But the downside of my Turner is the old style geometry. The RFX has a 68° headset angle which is the opposite of a slack angle now, more XC bike than Enduro nowadays. To change the headset angle, one of the solution is to change the fork for one with more travel. Not the easiest solution and not the cheapest one neither. But a friend of mine mentionned another solution: Offset bushings for the rear shocks. It’s very simple, instead having the screw in the middle, the hole is not centered. It virtually makes your shock shorter. The result is the rear end of your bike lowered, the bottom bracket lowered and the headset angle become slacker. Exactly what I need and on top of that, it’s a very cheap solution. I start looking for theses magics bushing on the internet. Production Prive makes offset bushing but unfortunatly only in some specifics sizes and only for 8mm bolt. But Google is my friend and finally I found a company which does exactly what I need, customs offset bushings for 6 or 8mm bolt: Offset bushing. 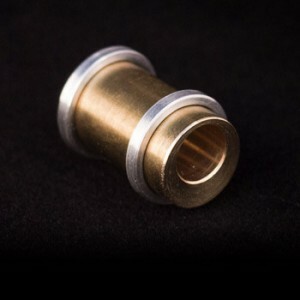 The second good news is the price: only 10£ per bushing. So for 2 bushings and the delivery in France the total is only 24£. The third good news is that with a 6mm bolt my angle change is 1.5° instead of 1° only for 8mm bolt. Smaller screw means more offset and slacker angle 🙂 So my bike heaset angle will decrease from 68° to 66.5° more in the todays standard for Enduros bikes. Mounting the offset bushing is very easy. It’s basically the same job than mountaing any regular bushings. For my first ride, you can immediatly feel the difference on the bike. Even visually, the looks change and you mount on your saddle, you notice the difference, even on the parking lot. In the trails, the bike is more stable and it becomes easier to keep your speed in the fast turns. In very steep corner, I feel more confident when it’s steep because you’re less on top of the handlebar ready to pass over the bar. At 66.5° the angle is not slack enough to cause any troubles in sharp turns. My bike is not yet a big downhill bike. The change doesn’t affect the progressivity of the rear suspension. In theory it does a little bit but you can’t really feel the difference. You will just have to re adjust the pressure in your shock to set up the corect SAG. The bottom bracket is lowered too, but on a old style geometry with a quite high bottom bracket, it’s just all good. But don’t expect a big difference like for the headset angle. The offset bushigs are an excellent solution for slacker your headset angle for a very cheap price. The modification is of course reversible if you don’t like it, so you don’t take any risks trying it. The difference on the angle is higher with a 6mm screw comare to with an 8mm screw. Just check that your frame can accept the new bushings: The swingarm will come closer to the frame, so make sure you have enough space left to don’t bump the swingarm into the frame if you bottom out the rear suspension.